Last Tuesday, the Victorian Court of Appeal, by a 2-1 majority, granted an injunction preventing a principal from converting a bank guarantee for unliquidated damages. The Court of Appeal’s decision reinforces the importance of having contractual provisions which provide the principal or head contractor with a broad right of conversion. In 2014, Dedert Corporation (Dedert) was engaged by United Dalby Refinery Pty Ltd (United) to undertake the design, construction, supply and installation of a drum dryer system at a United refinery in Dalby, Queensland. Under the contract, Dedert furnished one unconditional bank guarantee in favour of United, totalling US$542,340.00. Under clause 5.2 of the amended AS 4902 contract, United was entitled to have recourse to the bank guarantee in circumstances where it remained “unpaid after the time for payment”. After supply and installation, United alleged that the drum dryer system was defective and that the cost of defect rectification was US$866,354.24. By letter dated 13 November 2017, United stipulated that it had ‘suffered direct losses equalling or exceeding the amount of the bank guarantee’ (the Letter). In accordance with the contract, the Letter gave Dedert 5-days notice of United’s intention to call on the bank guarantee. Dedert commenced proceedings in the Supreme Court of Victoria for an injunction restraining United from calling on the bank guarantee. On 29 November, the trial judge refused to grant the injunction. Dedert subsequently sought leave to appeal from that decision. The principal submission advanced by Dedert was that United was not entitled to recourse to the bank guarantee where the claims made for ‘direct losses’ were not in respect of an amount which remained “unpaid after the time for payment”, pursuant to clause 5.2. Accordingly, as the ‘direct losses’ asserted by United in the Letter did not constitute monies which remained ‘unpaid after the time for payment’, his Honour held that a right to recourse under clause 5.2 had not been enlivened. Kaye JA applied the Qld decision of RCR O’Donnell Griffin Pty Ltd v Forge Group Power, where the Queensland Court of Appeal considered and interpreted a clause in almost identical terms to clause 5.2. “…where the contract did not preclude [United] from having recourse to the security, the undertaking or guarantee should be unconditional in its form and effect. 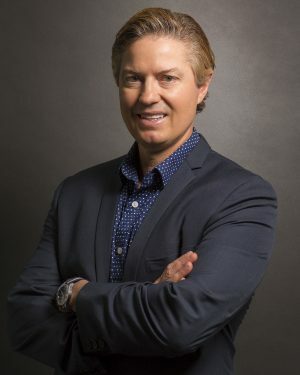 Ultimately, the Court of Appeal granted the injunction and held that United was not entitled to have recourse to the bank guarantee to satisfy its claim for unliquidated damages. The Dedert decision and the O’Donnell Griffin Pty Ltd decision highlight the importance of careful contract drafting and administration. It will be difficult to prevent recourse to security when the entitlement to do so depends on the subjective view of a party rather than the objective fact of a debt due. Accordingly, principals and head contractors should amend their contracts to include a broad right of recourse to security. the pro-forma guarantee or bond states that the secured amount is payable ‘on demand’ by the principal or head contractor, without any reference to the party who procured the security, and notwithstanding any dispute between the parties as to whether that amount is due and payable. 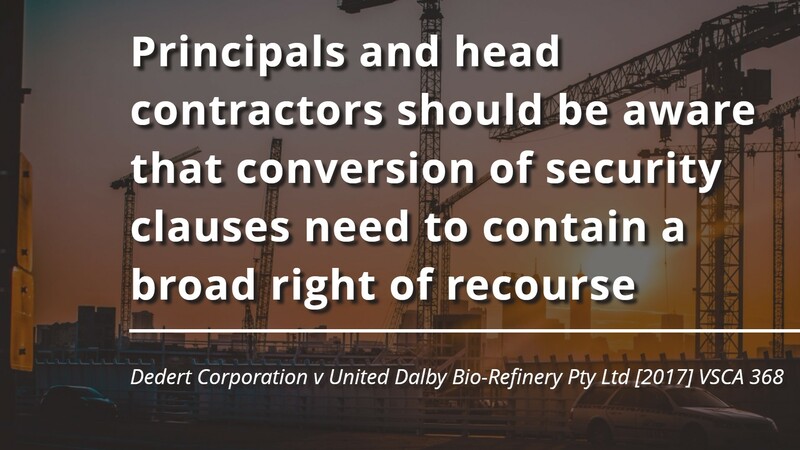 Dedert Corporation v United Dalby Bio-Refinery Pty Ltd  VSCA 368.